Andrea Lewis, the Issue 10 author of Vellum, has a new book out with Indiana University Press. It is a collection of linked stories, called What My Last Man Did. “Following generations of one family across nearly a century, each of Andrea Lewis’s intertwined, engaging short stories evokes an intense sense of place and time, from New Orleans in 1895 to Grand Isle, Louisiana, during the hurricane of 1901 and on to London during the Olympic Games of 1948. The people in these ten vivid tales face tragedy and real-world catastrophic events—war, hurricanes, the Great Depression, racial tension—in their pursuit of love, family, and belonging.” –Indiana University Press. Andrea Lewis’s stories, essays and prose poems have appeared in Prairie Schooner, Catamaran Literary Reader, Cutthroat, and many other literary journals. She lives with her husband, Wendell Tangborn, on Vashon Island, Washington. 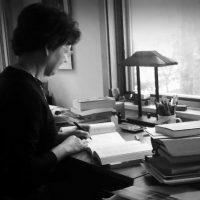 She is a founding member of Richard Hugo House, a place for writers in Seattle. Get “What My Last Man Did” here. If you’re still hungry for more of Andrea’s wonderful prose you can read her short story ‘Vellum’ in Pulp Literature Issue 10, Spring 2016.